Body fat measuring devices, analysis equipment and body fat scales or diagnostic scales identify body fat percentage and body mass index (BMI). Easy to understand and unerring in measurement, this device gives the user precise information about calculated fat. 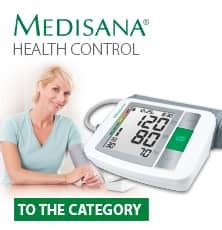 The devices identify in a single spectrum values that are important for health, such as weight, proportion of body fat and visceral fat (organ fat), skeletal muscle mass or basic metabolic rate. Fasting or water loss does indeed reduce body weight, but this reduction is usually not the equivalent amount of fat! Only those who correctly and consistently do something about their fitness can permanently turn fat into muscle mass. The best and easiest way to get a handle on the current state of your weight is through targeted measurement of body values - to control your diet or prevent metabolic syndrome.